It wasn't all that long ago that I got my new phone.. So many fond memories that I have with my phone that didn't take me back to the early days of telephone technology and Alexander Graham Bell..
Then it entered the pristine waters of the pool with me. Had I placed my phone in the rice, I might have saved it. 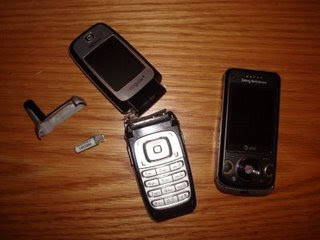 That's right, I had to get a new phone..
Water damage was too bad.. It did have a price, because I wasn't thinking about poolside days with my new phone when I bought it in March, I didn't get the insurance. And now Peyton has a new "toy" cell phone, that happens to smell like rice. That stinks. I like the new phone though. I Have never heard of freezing it. rice I have heard but HEY at least you got a new phone right!